When I was child, every living thing fascinated me. I’ve written before about how I used to get up close with every creepy crawly creature. I wasn’t afraid. Not of the bees and wasps, with their stinging potential. Not of the spiders, which everyone seemed to shriek about. Not of the ants, the woodlice, the slugs or the snails. I wasn’t fearless because I was tough, however. I was fearless because in my own small way I felt compassion for these creatures, in an innocent way I am unlikely to be able to repeat now. I wanted them to trust me, for all their weirdness and the difference of species, for all their varying sizes and diets. I was fearless because I cared, and that care was bigger than any potential fear. Perhaps this is a lesson I need to re-learn. Not with bugs and slugs and spiders but in how I approach the world and the people in it. The antidote to fear is love – compassion overriding terror of difference, of those I cannot understand. Not being afraid of their capacity to sting me or baffle me. Love casts out fear, but so often I let fear trump love. One day a wasp did sting me. It landed on the back of my neck, drowsy, in a school hall. I didn’t know it was there until the pain shot through my skin. Perhaps I moved my head, putting pressure on it and it struck back, bringing tears to my eyes. Me! Who had literally never hurt a fly! 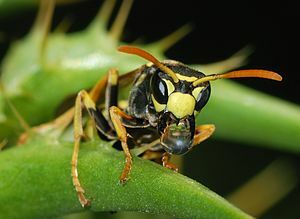 I confess, I never trusted wasps again. My experience me left me fearful. I remembered the pain – and the sense of treachery. Fear is not a good master. There are things that cause us deep pain, replacing trust with fear. We’ve been stung, we’ve been hurt. But if I let myself be ruled by these experiences I can never be free of them. The experiences will always temper me, it’s true. I can never entirely remove the marks they make on me. But I can step out from under their mastery, by reaching for the healing Spirit of God, to cleanse and restore me. Fear is not a good master. Love – God-love – is the best there is. I seek only that – that the love of Christ would be my fuelling force, not fear. …Christ’s love compels us, because we are convinced that one died for all, and therefore all died. And he died for all, that those who live should no longer live for themselves but for him who died for them and was raised again. When it comes to people, those we love and trust have far more power to ‘sting’ us than the casual acquaintance that happens to land on us. But then, I suppose that wasp was a representative of all the creepy crawlies that you had loved – it wasn’t an individual in the way that people are. Quite. I was thinking as I wrote – no intention of stretching analogy too far!